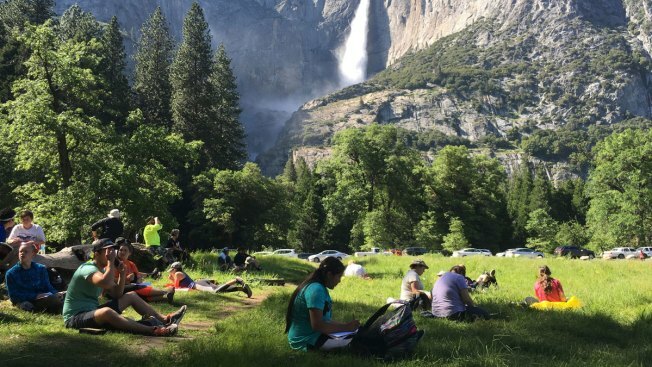 In this May 25, 2017 file photo, a class of eighth-grade students and their chaperones sit in a meadow at Yosemite National Park, Calif., below Yosemite Falls. Some of the West’s iconic national parks are beginning to partially close as they deal with overflowing restrooms and vandals on the 10th day of a federal government shutdown. Human feces, overflowing garbage, illegal off-roading and other damaging behavior in fragile areas were beginning to overwhelm some of the West's iconic national parks on Monday, as a partial government shutdown left the areas open to visitors but with little staff on duty. "It's a free-for-all," Dakota Snider, 24, who lives and works in Yosemite Valley, said by telephone Monday, as Yosemite National Park officials announced closings of some minimally supervised campgrounds and public areas within the park that are overwhelmed. "It's so heartbreaking. There is more trash and human waste and disregard for the rules than I've seen in my four years living here," Snider said. 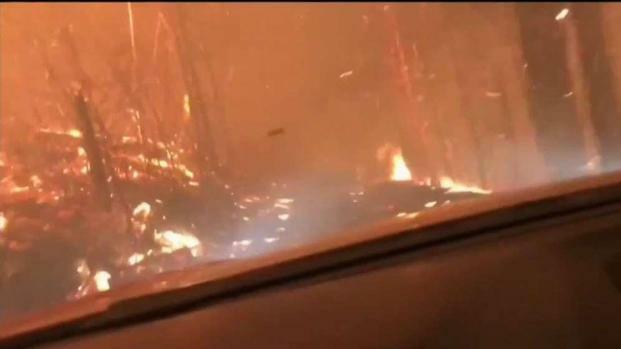 Charles Bilton and his son, Justin, both Massachusetts residents, recorded video as they attempted to drive through a wildfire in Glacier National Park in Montana. "We're afraid that we're going to start seeing significant damage to the natural resources in parks and potentially to historic and other cultural artifacts," Garder said. "We're concerned there'll be impacts to visitors' safety." "It's really a nightmare scenario," Garder said. Under the park service's shutdown plan, authorities have to close any area where garbage or other problems become threats to health and safety or to wildlife, spokesman Jeremy Barnum said in an email Monday. "At the superintendent's discretion, parks may close grounds/areas with sensitive natural, cultural, historic, or archaeological resources vulnerable to destruction, looting, or other damage that cannot be adequately protected by the excepted law enforcement staff that remain on duty," Barnum said. The campers had to drive through the Howe Ridge Fire after it quickly expanded. Campers at Joshua Tree National Park in Southern California's deserts were reporting squabbles as different families laid claims to sites, with no rangers on hand to adjudicate, said Ethan Feltges, who operates the Coyote Corner gift shop outside Joshua Tree. "The whole community has come together," Feltges said, also by phone. "Everyone loves the park. And there's a lot of businesses that actually need the park." A man in Yellowstone National Park is caught on camera taunting a wild bison in the middle of the road. Most visitors were being respectful of the desert wilderness and park facilities, Joshua Tree's superintendent, David Smith, said in a statement. "You're looking at Yosemite Falls and in front of you is plastic bottles and trash bags," he said. A baby chimp named "Mussa" was rescued from poachers in the Democratic Republic of Congo after several of his family members were killed. Mussa sat in pilot Anthony Caere's lap as he was flown to a chimpanzee sanctuary. The rescue was organized by Lwiro Primates and Viruga National Park. "It's definitely not our preference — the park service does a good job doing their thing and we hate to see them out of work," Watt said. "But it's something we can handle."